Captain’s Log, stardate 94909.72. Our mission began when, while researching protomatter in an area called “The Trench”, the Aegis received a distress signal from the Polaris in the Tyrus System. She had taken damage having been hit by an unidentified blast wave, setting them adrift and on a collision course with a nearby asteroid field. Ensign Rao, my soon-to-be-replaced helmsman, set an intercept course while my Tactical officer Lt. Hoyle locked on and disabled their malfunctioning engines. I need to put in a good word for Lt. T’nar for her excellent power rerouting to ensure we had engine power in spades, and enough phaser power to do the job before we lost the Polaris. True to form, after all the heavy lifting is done, the USS Raleigh shows up to take over rescue efforts as we warp to rescue escape pods in the Perseph system. Scanning anomaly-covered sectors, we discover 24 survivors to beam aboard. Unfortunately, they were being guarded by a score of cloaked Klingon D5 Cruisers, and we had to lower shields for an extended period of time to lock onto them with the transporter. What ensued was an incredible battle as the Aegis, outnumbered and outgunned, took down a score of foes while managing to rescue all souls, warping to safety at the last possible moment. As a Star Trek fan, I cannot overstate just how amazing my last few hours have been. While Star Trek: Bridge Crew is still a full month out from release on May 30th, today I’ve had the opportunity to play a near-final, but purposely-limited build of the game. The USS Aegis (designation NX-1787) is the platform for Ubisoft’s upcoming VR adventure. 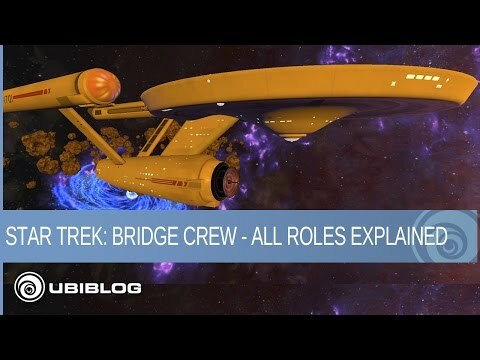 In Star Trek: Bridge Crew, players can serve as Captain, Tactical Officer, Engineer, or Helmsman, but even the official video from developer Red Storm Entertainment below hardly even tells you just how complex and incredible each and every one of these positions really are. Your crew are critical to success, whether human or AI. The build I have restricts to the second level of the game (mentioned above), and the “ongoing missions” multiplayer mode. After playing through the tutorial for each of the positions, I tackled that second mission (the only Campaign mission available), entitled “Sun and the Shield”. While I covered it in broad strokes in the intro, the gameplay was something entirely different. Like you, I’ve eagerly devoured every scrap of information on this game, including the gamescom, E3, and recent press junket previews. Nearly all of them were the same configuration — three press members and one Red Storm developer. Playing this build in my home, I have the opportunity to do something I’ve not read about anywhere else — playing solo with three AI crew members. The only position available for play in the campaign mission of this build was the role of Captain, which suited me just fine as that’s precisely where I wanted to be. When I imagine the job of a ship Captain, it’s all about decisions and directing others to action. When playing with AI, what would I have to do? It turns out, quite a bit. While each of the stations can and will act independently, they do serve at your pleasure. They await your orders, and they’ll execute them to the best of their ability. The Captain is, as their title suggests, in charge of every aspect of the ship. They sound Red Alert (which triggers the crew to raise shields and arm photon torpedoes), answer hails from other vessels, and generally have the command view of the situation. My first outing was, by all accounts (and a few deaths) an unmitigated disaster. I underestimated the amount of work it takes to run a starship, even with a full crew compliment. After my second run I started to get the hang of it, and was able to issue commands quickly and to the right crew member. Because I was playing with AI crew, I could take over their station at any time if I wanted to make more fine-grained adjustments like dangerous power rerouting — something the AI never seemed to do as it put the ship at risk. A staged shot that shows how pretty this game is. Lt. Hoyle, my Tactical Officer, is in charge of raising and lowering shields (something you’ll frequently do as transporter actions can only be done with shields in the lower position), phaser banks, scanning, and photon torpedoes. The torpedoes are a limited resource, so it’s critical to be judicious with them, as it’s hard to know how long a mission will become. This position can also target subsystems on ships (once shields are down) to disable engines, weapons, shield emitters, and more. They can also initiate a Disrupt Order, which can temporarily take down another ship’s weapons, shields, or engine, but the cooldown on this skill is lengthy. My Engineering officer, Lt. T’Nar is key to our success in and out of combat. While I’m in charge of telling the crew to navigate via impulse power, go to warp, or to reroute power, it’s my Engineering team that is responsible for making all of that happen. She has to charge the engine coils to take her to warp or set them to impulse mode for long range non-warp travel, she dispatches repair crews to the ship’s subsystems, and she handles the crucial power distribution for the entire ship. Power distribution is a huge component of effective combat in Bridge Crew. The ship has limited power nodes to share between phaser range, engine power, and shield level. On the distribution panel, these can be handled in large chunks, putting up to five nodes in any one area, but knowing that you have a limited amount of power to spend. Sliding a switch to Routing reveals some of the ‘magic’ of the Star Trek movies and shows — rerouting of subsystems. Inside this panel, you can cross-pollinate power from one system to another — engines to shields for instance, at the risk that you’ve now spread your damage potential across multiple systems. It’s a great risk/reward that the AI doesn’t take, but a human player just might. When I kicked Rao out of his seat and took over, I found that this station is in charge of aligning the ship’s heading, as well as the up and down “bubble” (to borrow the submarine term for the upward or downward angle of the nose of the ship). It is also responsible for speeds, as well as aligning for impulse or warp vectors. As the Engineer shuffles power, it affects affective phaser range, so the helmsman is your only chance of maintaining a combat-effective position. I’ve only begun to scratch the surface of what’s on offer in Bridge Crew, but my last few hours have been a Trekkie’s dream. Any thoughts I had about how simple this affair might have been vanished the moment I began to play. Far more than a simple “Star Trek Experience”, Star Trek: Bridge Crew is complex, engaging, and incredibly rewarding. The fact that there is a purported 40 hour campaign (my guess is that means 10 hours multiplied by four stations, but given how different each station is, I’m perfectly content with this), plus online multiplayer and randomized missions with AI support, makes it the most complete and expansive VR game to date. I cannot wait to see the rest of what Bridge Crew has to offer. Put simply — if you were waiting for a system-selling game to buy a VR headset, it has arrived. Star Trek: Bridge Crew is coming to Oculus Rift, HTC Vive, and PlayStation VR on May 30th, with four player online cross compatible support. Stay tuned for our full review.